This category features petite silk scarves size 8" x 54" (20 cm x 137 cm) - very elegant and chic, perfect for adding a touch of color and style to any outfit. All scarves featured in this category can be created in larger sizes as Custom Orders. Please send an email with your ideas to sales@silkscarvescolorado.com and we can discuss the new design. Blue, Steel Blue Hand Painted Silk Scarf Crystal Callas. Size 8x54. Silk Scarves Colorado. Birthday Gift. Gift Wrapped. This is a 100% habotai silk scarf featuring calla lilies in steel blue on a background in royal blue. It is a smaller-size scarf, very elegant and chic, perfect for adding a touch of color and style to any outfit. SIZE: This is a very elegant and chic scarf, perfect for adding a touch of color and style to any outfit - size 8" x 54" (20 cm x 137 cm). This is original size - slight shrinkage occurs due to the steam-setting process. 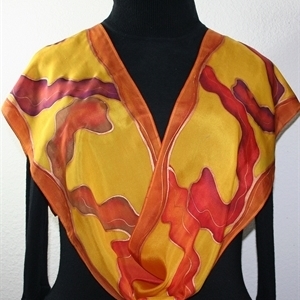 Golden Terracotta, Burgundy Hand Painted Silk Scarf Golden Waves. Size 8x54. Silk Scarves Colorado. Birthday Gift. Gift Wrapped. This is a 100% habotai silk scarf featuring wavy shapes in warm autumn shades - brown, burgundy, merlot red, orange terracotta - on a golden terracotta background. Outlines are done in bronze. SIZE: This is a very elegant and chic scarf, perfect for adding a touch of color and style to any outfit - size 8" x 54" (20 cm x 137 cm). This is original size - slight shrinkage occurs due to the steam-setting process. 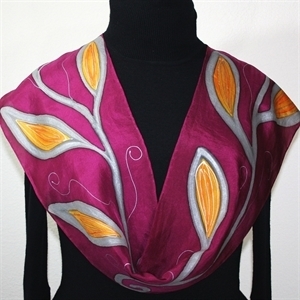 Merlot Red, Golden Terracotta Hand Painted Silk Scarf Golden Leaves. Size 8x54. Silk Scarves Colorado. Birthday Gift. Gift Wrapped. This is a 100% habotai silk scarf in deeper shade of merlot red (lighter burgundy red), featuring branches of leaves in golden terracotta. Outlines are done in pewter. Decorated with thin accents in silver. SIZE: This is a very elegant and chic scarf, perfect for adding a touch of color and style to any outfit - size 8" x 54" (20 cm x 137 cm). This is original size - slight shrinkage occurs due to the steam-setting process. 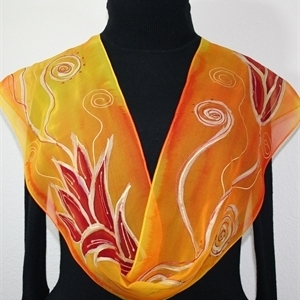 Orange, Yellow Hand Painted Chiffon Silk Scarf Fire Flowers. Size 8x54. Silk Scarves Colorado. Birthday Gift. Gift Wrapped. This is a 100% Chiffon silk scarf in the contrasting colors of burnt orange and black, featuring stylized tulips in raspberry. Outlines and decorative accents are done in gold. SIZE: This is a very elegant and chic scarf, perfect for adding a touch of color and style to any outfit - size 8" x 54" (20 cm x 137 cm). This is original size - slight shrinkage occurs due to the steam-setting process. 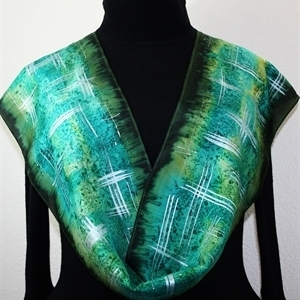 Green, Teal, Dark Pine Hand Painted Silk Scarf Spring Haze. Size 8x54. Silk Scarves Colorado. Birthday Gift. Gift Wrapped. This is a 100% Habotai silk scarf featuring geometrical shapes in shades of light emerald green, dark pine, teal, and sage green. Outlines are done in metallic green; with decorative accents done in silver. SIZE: This is a very elegant and chic scarf, perfect for adding a touch of color and style to any outfit - size 8" x 54" (20 cm x 137 cm). This is original size - slight shrinkage occurs due to the steam-setting process. Green, Teal, Purple Hand Painted Silk Scarf Grape Country. Size 8x54. Silk Scarves Colorado. Birthday Gift. Gift Wrapped. 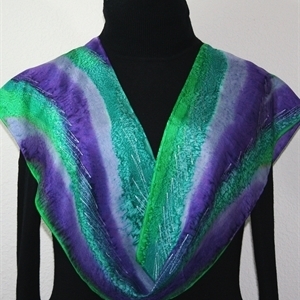 This is a 100% habotai silk scarf in lavender, purple, teal and green; decorated with thin accents in silver. SIZE: This is a very elegant and chic scarf, perfect for adding a touch of color and style to any outfit - size 8" x 54" (20 cm x 137 cm). This is original size - slight shrinkage occurs due to the steam-setting process. Green, Lime Hand Painted Silk Scarf October Rain. Size 8x54. Silk Scarves Colorado. Birthday Gift. Gift Wrapped. 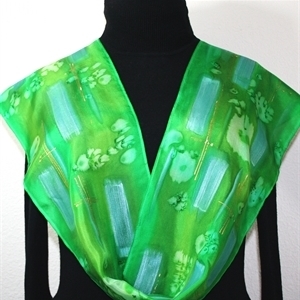 This is a 100% Habotai silk scarf in shades of green and lime; decorated with brushstrokes in metallic turquoise, and thin accents on gold. SIZE: This is a very elegant and chic scarf, perfect for adding a touch of color and style to any outfit - size 8" x 54" (20 cm x 137 cm). This is original size - slight shrinkage occurs due to the steam-setting process.